Earlier this week Randy and I got to attend Munce Group’s Christian Product Expo for Fall 2017. It is a gathering of publishers, writers, manufacturers, distributors, and book store owners (with a few media/bloggers thrown in) dedicated to Bibles and Bible related merchandise. 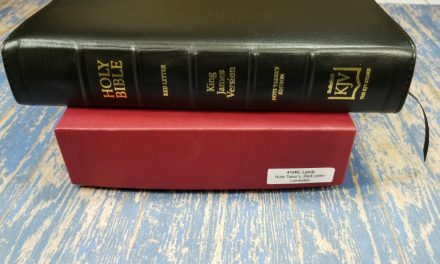 With various different events going on besides the show floor it is designed not just to generate sales but to let all the various branches of the Bible industry encourage and inform one another. We like attending these shows because we get to see friends from previous shows, meet in person our industry contacts, become aware of new products and new providers of products, and learn lots of things that will help us better serve the Bible Buying Guide readers. Some of the products shown are already in your local Bible bookstores, and most of the rest will show up before Christmas, but a few of them won’t be released until spring. 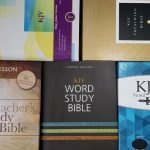 You’ll notice this post is heavily Bible centered but we are Bible Buying Guide. 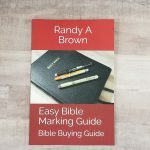 I have two more posts about the show up, one dedicated to close up photos of Bibles and one about Bible journaling that includes specialty Bibles and Bible marking products. 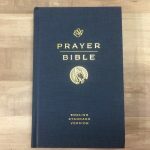 Crossway has a very interesting Bible about Archaeology due out in the spring that we got to see previews of and Tyndale is providing us with several of their upcoming and newly released study Bibles for review. and Christian Art Gifts. 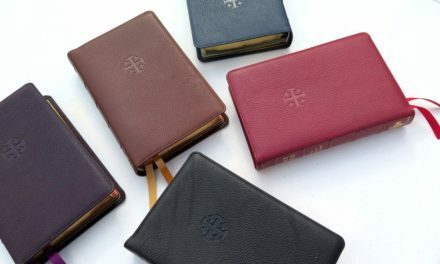 Christian Arts is more known for their gift products than their Bibles but they do make beautiful Bibles, some of which will be featured in the other two show posts. Abingdon Press, AMG Publishers, Baker Publishing, BookMasters, Broadstreet Publishing, David C. Cook, Intervarsity Press, and Moody Publishers all showed together in one big booth so you’ll probably find their products mingled in the next three photos. Xulon Publishing was also there. We missed getting to talk to a few publishers (most notably Hendrickson/Rose) because they were just so busy whenever we weren’t. We got to meet the people at a few less well known publishers too. Multi-Language Media helps distribute Bibles in over 100 different languages including New Testaments and ones that are parallel with English. and Pamela Christian (author of a three volume set, Examine Your Faith, Renew Your Hope, and Revive Your Life, designed to help people examine and strengthen their faith). I’ll be reviewing the third in the series within a month and the first as soon after that as I can fit it in. We also got to talk to Jann Gray (who we already know and love) about her newest book (Stones of Remembrance, about legacy journaling), upcoming workshops, and new products coming out. Most of Jann’s new products are distributed by G.T. Luscombe Company. These people are a joy to talk to because the are so knowledgeable and enthusiastic about their products and the Bible industry. Jann and GTL will be featured in both the CPE Bible journaling post and upcoming reviews. We also met a few distributors like Ingram who sell products from a variety of sources including some who couldn’t make this show themselves. There were a lot more gift centered booths we didn’t get photos of or spend much time at and we wish we could have featured more of them. Two remaining booths worth mentioning are ones with a help the community goal. Samaritan’s Purse, while they were trying to gain support for their Operation Christmas Child campaign at the show that’s not all they do. They and their volunteers have already been hard at work helping the recent hurricane victims in Texas, Florida, and St. Martin. and Thistle Farms. I had never heard of them before talking with the two ladies at the booth. Their mission is to help women survivors of trafficking, prostitution, and addiction. They provide safe housing, counseling, and job training (how most of their products get made). They are based in the Nashville area but they have several Global partners providing similar services for women all over the world. We enjoyed our visit to Christian Product Expo. It’s always a pleasure to meet and talk to others who care about the Bible industry and getting people to read God’s Word. Because of limited time there were many people we didn’t get to talk to and many events we couldn’t attend. I hope we get to attend future CPE shows (and similar industry events) and I hope we can spend more time on our next visit. When we do our next show what do you think we should focus on? Upcoming releases? Author interviews? Publishers and other industry leader interviews? What section of the show (besides Bibles of course) should we make sure to highlight? Let us know in the comments.